The layered fabrics make it look kind of watery. Cool! I'm a Va Beach (First Colonial) native as well. I was all excited when I saw "Cape Hatteras" in the subject line. That's where alot us Beach natives go to get away from the tourists. Thanks for the sweet reminder of home. I'm actually a First Colonial "native" (as close to being a native as I can get, lol!) too!! I collect lighthouses so I just love love love it!!!!! You're very welcome. And I absolutely new just what it was from the thumbnail on the front page. You did an amazing job capturing Hatteras. This pic is from 1999 when they were moving it from the shoreline, but you can see you nailed it perfect! Down to a 12 and shedding more lbs. everyday! 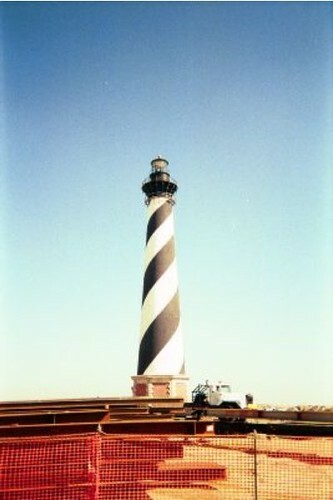 I walked up one of those things in the OBX. It nearly killed me, I knew what it was as soon as I saw the thumbnail. God, the view from the top is beautiful too. Love it! Cape Hatteras rocks my world. I love how many of you guys know what it is!! You've all made my day!! "You will believe a boy can fly"